Michael Mulvey was ordained the eighth bishop of the Diocese of Corpus Christi on March 25, 2010. Pope Benedict XVI named him bishop on January 18, 2010. 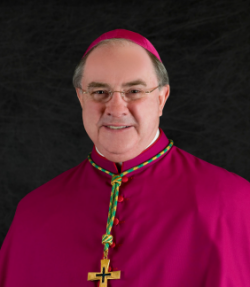 Bishop Mulvey was born August 23, 1949 in Houston Texas. the second of six children, to Daniel H. Mulvey Jr. and Marjorie Jane Patterson Mulvey. He completed all of his education at Catholic schools, including St. Theresa and St. Cecilia in Houston and St. Thomas High School in Houston. He graduated from St. Edward's Catholic High School in Austin in 1967 and St. Edward's University in 1971 with a BBA. He attended seminary at the North American College in Rome from 1971-1976. He earned his bachelor's degree of Sacred Theology from St. Thomas University (Angelicum) in 1974 and licentiate (master's degree) in Sacred Theology from Gregorian University in 1976. Mulvey spent a sabbatical year with the Focolare Movement in 1981, devoted 1995-97 to helping run a Focolare center for diocesan priests in Florence, and 1997-99 running a similar center in Hyde Park, New York.